Made some outriggers for a canoe my buddy and I use to hunt out of using PVC and pool noodles. Worked very well. We basically made the frame out of 1" PVC (IIRC) and then slid the pool noodles onto the PVC to create the flotation for the outriggers. If you're not concerned about looks, outriggers would work just fine. You may not be able to use them while at speed. But, if you could somehow deploy them while fishing, that would be awesome. Another alternative would be to fabricate some floatation pods to mount on the transom below the waterline. This would be more expensive, but also more practical. It would give you lots of stability, as well as increasing payload capacity. This is what I have so far. 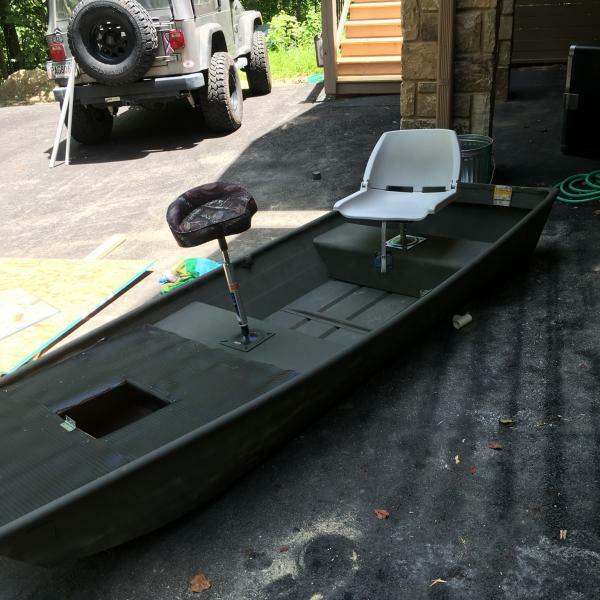 I got the boat for free so I have plenty of money to play around with on it. If you Google sportspal they use foam on the side of their aluminum canoe and seems do the trick. Never into one of those but did pick up one at a dealer to see the weight it's like feather compares to glass canoe the same length. There must be a reason for the added foam to the sides and worth trying. That looks like something that would work. If I bought some foam rollers and cut them in half, what would be the best way to secure them? I would try nylon lock nuts and long bolts either through the gunwale or side of the hull with big washers. It will be permanent but if you drill smaller holes ( 3/16 or 1/4) in the worst case you can fill it with rivets or even stainless nut's and bolts if you decide to remove it in the future. I've put outriggers/stabilizers on both a canoe and a kayak. Nothing to it if you use PVC and large foam swim noodles. Strap them down or screw them down. You do NOT want the stabilizer to let go when you lean over the side. I doubt that any mastic or glue or JB Weld ( good stuff they say) would hold the foam permanently. If the glue held really well, you still have the chance that the foam would tear, just when you need it the most. The prior suggestion of big plastic washers (by Spcamo) is similar to the way that Craftsman ( Sears) added foam to its canoes many years ago. That would be a mechanical fastener, and much safer IMHO. The boat is small, plain and simple. Putting money into it just puts you closer to getting into a bigger/wider more stable, SAFER boat. It is what you have to work with but it's not that hard to sell and find something else if you look around. Lost a good friend of mine last year. He was using a 3hp Mercury on a 10' jon. Fished out of it for years by himself. Last year he was on the local lake, calm water. A small "barbecue storm" popped up and generated some wake. The little 10' boat was so unstable that even the small wake from the storm, which could not have been more than 12" in my past experience out there fishing with him, that the boat capsized and he didn't make it. RIP "big John". I have a 1232 that I throw in the back of the truck and fish out of on lunch break but I guarantee you that once in the boat, I DO NOT stand up, or for that matter move around much at all. It's just too unstable. I had thought about picking up a trailer and then rigging up some pods or sponsons or something to help with it, but then I'm right back to trailering the boat to/from the lake and pouring money into something that'll never compare to my other boat (1548). 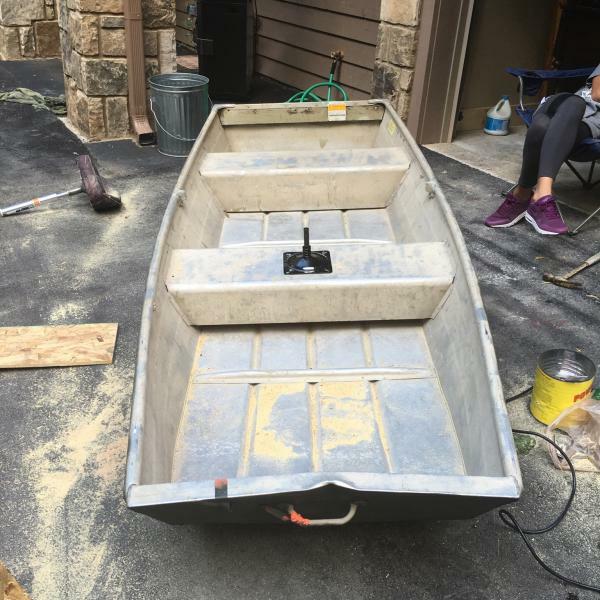 Adding casting decks and pedestal seats in a 10' is going to make it even more unstable! Just my opinions and experiences, FWIW. Good luck. the fishing deck doesn't help. Any weight above the water line on a boat that small is gonna make it less stable. Take the deck out and build one on the floor. It will make a noticeable difference. Those seats take an unstable hull and raise the center of gravity HIGH above the balance point in the boat. The foam sponsons on the sides of the hull might keep the 32 inch width from dipping into a wave, but the person sitting high above will be whip-lashed over the side. The sponsons would not protect the person. Turbotodd's story is a precautionary tale. Sadly, his is not unique.